The Hornell Common Council on Monday approved applying for a Transportation Enhancement Program Grant, which could help fund the creation of a walking/biking trail from Hornell to Arkport, possibly paving the way for a bike trail between Arkport and Canisteo. Mayor Shawn Hogan said he has had preliminary discussions with Ken Isaman, Hornellsville town supervisor, about paving the walking trail from Shawmut Park to Webbs Crossing Road to start create a walking/biking trail from Hornell to Arkport. According to Hogan, the city is going to begin the planning and budgetary stages for the trail from Shawmut Park to Webbs Crossing, then look to develop the area running from East Avenue to Belle Haven and turn it into a well-developed trail. Hogan said Hornell is “missing the boat” by not developing full-blown bike trails. The Council also approved the Hornell Area Humane Society conducting a door-to-door dog-and-cat census in response to the cat overpopulation problem in the city. A new driving guide makes it easy for the public to visit the Chemung River by vehicle, enjoy the natural views and learn about the waterway’s history. 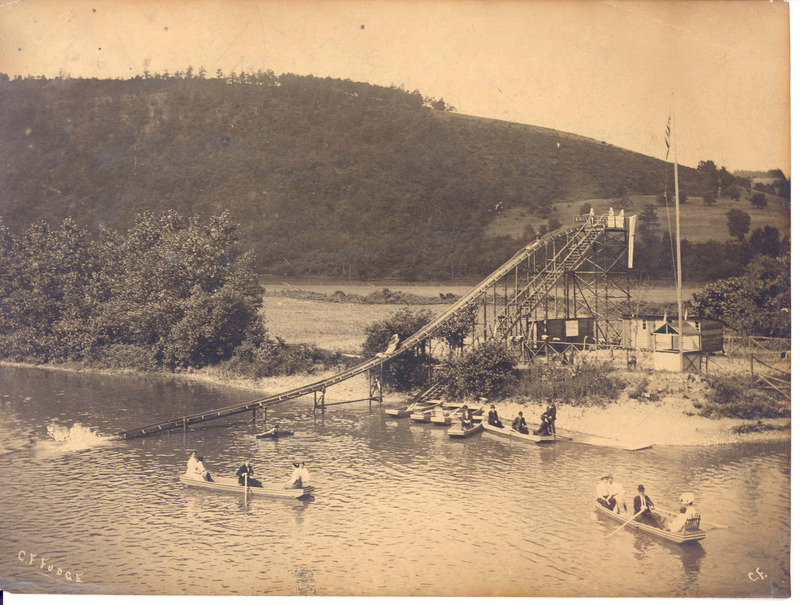 “Shoot the chute.” The new driving guide tour includes a visit to the site of a former wooden water toboggan used in the early 1900s near today’s Fitch’s Bridge in Big Flats where locals went to “shoot the chute” and ride a wooden sled down the toboggan into the river. (Photo provided by Friends of the Chemung River Watershed). Notice the boat paddlers in suits and ties. “A Driving Guide to History Along the Chemung River,” a free 12-page publication, includes maps, photos and GPS coordinates to historic sites along the river, including a former Civil War prison camp, the Chemung Canal, tobacco farms and a wooden water toboggan. It is a self-guided driving tour of the river between Big Flats and the town of Chemung that helps people explore the 45-mile river and learn about its historical significance. The scenic two-hour tour visits historic sites and boat launches and brings you to the river’s edge and history’s doorstep. Many of the boat launches include kiosks spotlighting local history for visitors. A word of caution: Some of the narrow boat launch access roads are crushed stone or dirt, so conditions can be rough at times. 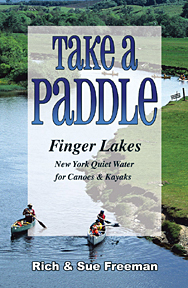 The full-color spiral-bound guide was written and published in a partnership between the Friends of the Chemung River Watershed (River Friends) and the Chemung County History Museum to encourage the public to visit the river and learn about its history and natural beauty. It was paid for by a grant through the museum. A family enjoys the Lackawanna Rail Trail. Photo provided by Chemung River Friends. The Lackawanna Rail Trail runs 2.5 miles between Eldridge Park and East Water Street, in Elmira, NY. 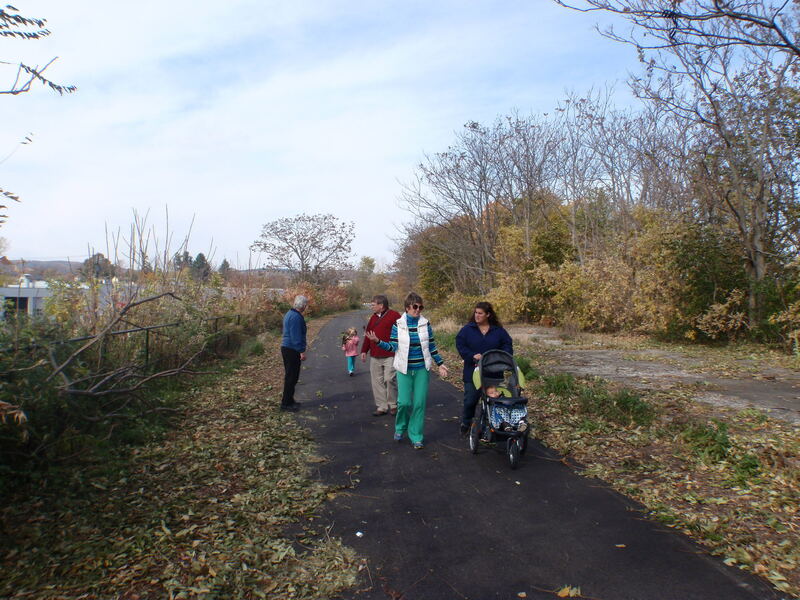 The 15-foot-wide paved trail was built along the path of the former Lackawanna Railroad. It’s mostly level and can be used for walking and running, cycling, inline skating and pushing baby strollers, among other activities. The northern portion weaves over the city’s Eastside industrial center, via railroad overpasses. The southern section follows Newtown Creek and offers scenic views of nature. For information on the trial contact River Friends at 607-846-2242 or riverfriends@stny.rr.com. Binghamton NY area hiking trails might be getting a new look. The Binghamton Metropolitan Transportation Study, or BMTS, held a presentation Wednesday at the Broome County Public Library to show off their proposed signs for the Greenway Trail System. This system will be the joining of trails from several different municipalities, and BMTS is trying to make them easier and more enjoyable to use. In order to accomplish that goal, they have designed a uniform signing system, while still allowing for each trail’s individuality. “Each municipality does have its own signing. That’s one of the objectives in this sign plan, was to incorporate what’s out there, rather than replace it. The point, too, is even though we’re proposing a uniform signing system, we want each individual trail to keep its own unique character, as well,” said BMTS Senior Transportation Planner Scott Reigle. Reigle said the next step in the process will be to raise funds for fabrication and implementation of the signs. Click here for another article on the subject.